Schuylkill Transportation System surveyed the riders of their fixed route bus service over the period July 5, 2017 to July 11, 2017. “Larger than life” advertising available on our vehicles that travel daily (excluding Sundays) to just about every “nook and cranny” of the county. Learn more about available STS Shared Ride Services. A 30 Day Reloadable Smart Card is a great cost savings to many passengers who utilize the fixed route bus system on a regular basis. Get real-time route information on your Android or iOS smartphone with the MyStop® app. 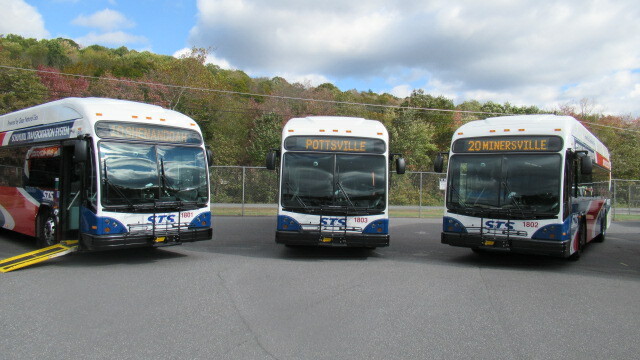 POTTSVILLE LOOP - RT 100 - FRIDAY APRIL 26, 2019 WE WILL BE UNABLE TO SERVICE ALL STOPS ON MAHANTONGO ST. INCLUDING THE NECHO ALLEN BEGINNING AT 12 NOON.